Thank you to the author for providing me with an ARC to review. A plan was laid out as the Evolution crushed mankind, a plan that was right under Eden’s nose all along. And Eve is the key to everything. New Eden, mankind, they have a small chance at fixing their dismembered planet. Eve has been content with the family she’s found, Avian, West, Gabriel, Royce. But she’s about to discover she may have the one family Eve never thought she would: blood. With every odd stacked against her, all the lies and all the secrets of her origins will be exposed. It only been mere months since Eve had temporarily stopped the Bane from entering New Eden's settlement zone, after setting off the Pulse. With the Bane now starting to regroup, Sweeping through desolate towns and destroying everything in their wake, the time has come to save what little is left of humanity, or die trying. It's now or never, when Doctor Evans devises a plan that only Eve can carry out. Eve is one of a kind, or she once was until she discovered that she was brought into this world with a sibling. She possesses superhuman strength and an toughness akin to an armored vehicle. Eve is human, part girl and part of the Torbane legacy. To be given a fighting chance as a child, Eve was given a series of injections in order to survive, an innovative and new invention that infuses human cells with technology. The technology that saved Eve's life, also aided in the apocalyptic world as they know it. The Torbane had fused and evolved humans until they were more machine than man, and now threaten the small pocket of society that the human race is now depending on for survival. Eve had been embedded with a Kill Switch, a signal the team at New Eden plans to direct towards the satellites still orbiting the Earth. Transmitting the signal back to earth to hopefully wipe out the Bane... Worldwide. But Doctor Evans isn't sure the satellites are still functional, but with the Sweeps gaining strength, Eve is the only hope the new civilization has, including the pregnant Morgan. The code needed is still at the Novator Biotics facility, as are the supplies needed for the Nova, the invention that is said to transmit the signal to the satellites. Eve hasn't seen the facility since when the world begun to crumble. The facility that not only saved her life, but kept her and her sister imprisoned. With an extra stowaway, Eve's team of Bill, Avian and West are set to make the dangerous journey via solar powered vehicle, but what will they find beyond the city limits? Strangely, the Bane are nowhere to be found. But when they reach the facility, it seems that someone has been living there... And recently. But as tragedy makes way for a miracle, West finds what he came for and just in time before the Bane are heading towards the facility in their thousands, leaving nothing in their wake. With the extra cargo aboard, the team are running for not only their lives, but for humanity. The Bane are collecting, moving and destroying anything that may be housing humans. Time is running out. Eve has the weight of New Eden and the world on her shoulders, but will hope be enough to save the world? 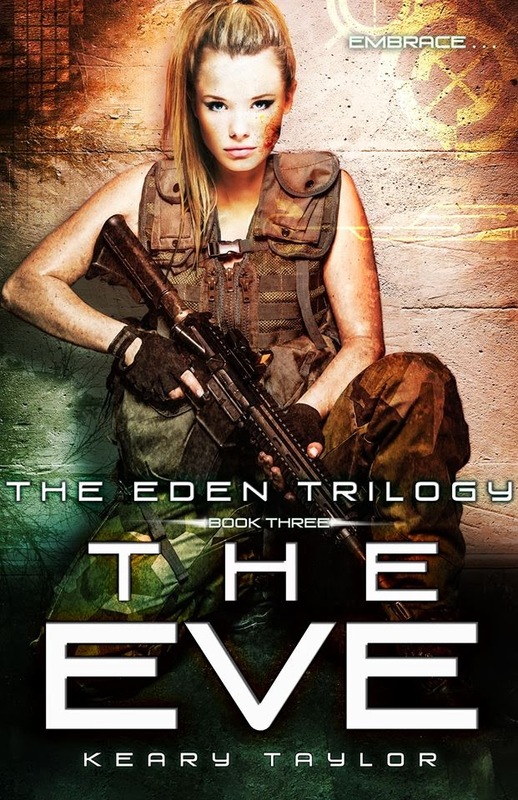 The Eden Trilogy is among the best young adult series I've read thus far. If you're a fan of Julie Kagawa's Blood Of Eden series mixed with Terminator and Divergent, you'll absolutely love this series. Keary Taylor doesn't hold back and creates real characters in extraordinary circumstances, who are each trying to survive what is potentially the end of the world. The Bane who were once human, when scientists created a technology that fuses with human cells to wipe out terminal illness, disease and aided the dying, but they didn't cater for the technology evolving and creating machines, wiping out man's humanity. With a simple touch, they can infect you, until every last human has evolved. It's young adult science fiction at it's best, infused with a post apocalyptic world and a romance to make your knees buckle. I couldn't put this one down. Too many series finales this year have been disappointing, but The Eve by far exceeded my expectations. It was engaging, thrilling and I'm not ashamed to admit that I read the last few chapters in tears. Absolutely incredible Ms Taylor.